“How should you read the Book of Mormon?” It’s a question that is often asked by both lay and scholarly readers of the foundational scripture of The Church of Jesus Christ of Latter-day Saints. 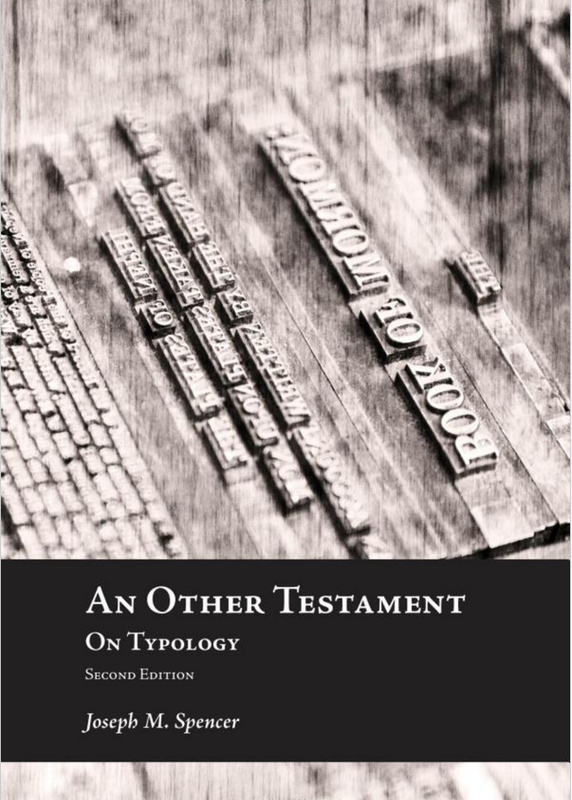 But instead of asking this, another, arguably more interesting question would be, “How does the Book of Mormon read itself?” This is essentially the question that Joseph Spencer seeks to answer with his new volume An Other Testament: On Typology. Re-published in a second edition by the Neal A. Maxwell Institute for Religious Scholarship, An Other Testament looks at how the authors within the Book of Mormon read and interpret each other’s words. Spencer straightforwardly remarks, “I draw conclusions about how the Book of Mormon–––according to the Book of Mormon itself–––should be read” (p. xxii). Simple enough, right? Actually, as Spencer brilliantly demonstrates, the Book of Mormon’s complexity and sophistication defies a simple, surface-level reading. “If readers of the Book of Mormon are to read the book as the book itself suggests it should be read, they must pay close attention” to its messages on a number of theological points, particularly God’s covenant with Israel, and the literary methods used in communicating those messages (p. xxii). To accomplish this, Spencer focuses on a few case studies of where the Book of Mormon either interprets itself or appropriates other texts (especially the writings of Isaiah) in its own narrative or theological structure. He begins by looking at how Alma’s conversion narrative in Alma 36 deliberately mirror’s Lehi’s own sôd experience in 1 Nephi 1. In other words, Alma 36 turned Lehi’s own experience into a type that was reenacted by Alma himself. “Not only does Alma tell a story in which history is reconciled with a revelatory event, he also relates that story–––as fragment of history–––to another revelatory event, namely, that of [Lehi’s in] 1 Nephi 1. While the prophetic event remembered with the narrative spiritualizes Alma’s past history of sin, the visionary event reenacted in Alma’s telling of the narrative spiritualizes Alma’s past history of conversion” (p. 26). It is easy enough to simply notice that Alma directly quotes 1 Nephi 1 (Alma 36:22). Spencer takes his analysis to a fascinating new level, however, in showing how the entire structure of Alma’s narrative typologically reflects Lehi’s. 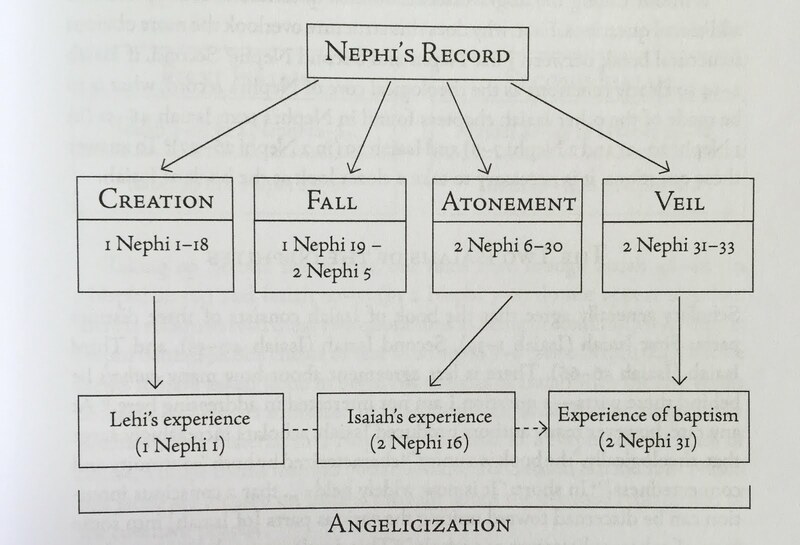 Spencer’s restructuring of Alma’s conversion narrative as a reenactment of Lehi’s experience in 1 Nephi 1. What I was especially impressed with, and what I think is the strongest, most fascinating argument made in the book, is Spencer’s analysis of how Nephi utilized (or “likened”) Isaiah in his record. The Isaiah chapters in the Book of Mormon have been a stumbling block for many readers. Critics have made easy (and often lazy) accusations of slavish plagiarism on Joseph Smith’s part because of the Book of Mormon’s large quotations of Isaiah. Others, including Latter-day Saint readers, typically skip the block citations of Isaiah because it seemingly offers nothing new or terribly important to the overall message of 2 Nephi. Spencer plainly shows why both of these attitudes are misguided and unpersuasive. In fact, Nephi’s use of Isaiah is exegetically and typologically intricate, not the product of lackadaisical cribbing. “The picture produced in the course of this investigation is one in which Nephi’s record is built on complex, detailed readings of Isaiah, distributed in intentional ways between the two books that make up Nephi’s contribution to the small plates” (p. 34). This point, of course, has been explored at length, but Spencer’s contribution is no less interesting and meaningful. There is much that I liked about Spencer’s analysis of Isaiah in 2 Nephi. His two chapters on Nephi’s use of Isaiah (pp. 33–104) are packed with great insights, but perhaps my favorite was his discussion of Nephi’s narrative and theological outline in 2 Nephi reflecting the creation, fall, atonement, and veil (the temple). I can’t do Spencer’s argument justice in this brief review, as it is fairly complex. The reader should simply pick up a copy and read it for him or herself. What I can do is provide a tantalizing teaser with the chart below from Spencer’s book. I’m not sure I can adequately describe how wonderful I thought An Other Testament is. I thoroughly enjoyed it, and would heartily recommend it to anyone who wants to seriously engage the Book of Mormon in a meaningful way. A close reading of the Book of Mormon is both spiritually and intellectually rewarding, and Joseph Spencer is an excellent guide through such a reading. You're fast, unless you got an advance copy! Thanks for the review. I'll definitely put it on my mountain of 'to-reads'. I am currently reading the 1st version… Is there much difference? No, just a new preface and typographical corrections, etc. Content-wise it's the same. Thanks for the review. I am always fascinated by Isaiah. I will have to read this book. Side question, are you named after your father? About 15 years ago I had the honor of meeting about once a week with a Steve Smoot and his friend Louie. I will forever be indebted and greatful for the time they took to teach and discuss gospel treasures with me and some of my friends.